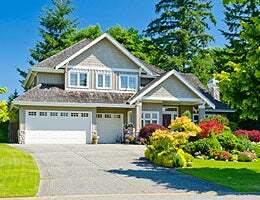 When selling your home, landscaping determines whether your home feels inviting from the outside. Curb appeal is important to 71 percent of homebuyers when choosing their abode, according to a 2013 National Association of Realtors survey. Landscaping is a large part of that curb appeal, says Frank J. Lucco, managing director of IRR-Residential Appraisers & Consultants in Houston. “That first impression is important,” says Lucco. “If they don’t like the looks of the front of the house, which is mostly landscaping,” often they won’t even go inside. A landscaping investment could potentially pay a 215 percent return in home value, says Margaret Woda, a Realtor with Long & Foster Real Estate in Crofton, Md. While you may only recoup 68 percent of kitchen renovation fees, Woda says landscaping is money well- spent. Keeping up with the Joneses is important, says Lucco. If your neighbors’ yards are run-down, spending a lot on landscaping isn’t worthwhile. But if your neighbors have renovated homes with beautiful greenery, you need to do the same so buyers don’t move on to homes with better curb appeal.